Student learning outcomes—telling how effectively an institution delivers and assesses the learning required for a given credential and facilitates comparisons of various institutions’ credential quality. 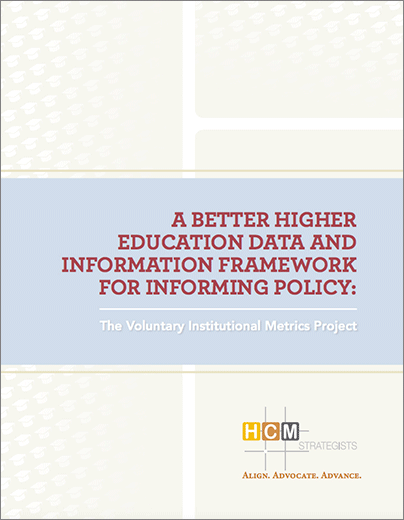 While there are major challenges that must be addressed in order to access some of the desired data, by moving to the defined set of five critical metrics laid out in the report The Voluntary Institutional Metrics Project, institutions can collectively provide a holistic perspective on institutional performance across postsecondary sectors. This work was made possible through the generous support of the Bill & Melinda Gates Foundation, and was coordinated by HCM Strategists.